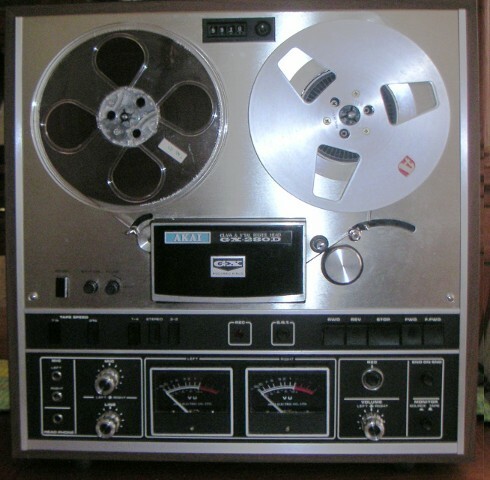 A few years ago I bought - on ebay - an Akai GX-280D reel-to-reel tape deck dating from the early seventies, as I had a collection of my father's tapes of family gatherings in the fifties and sixties that I wanted to convert to digital format. I originally had about 17 tapes - my sister has since found another 13 - and I set about transcribing them with the Akai deck, a laptop, and some audio recording software. The deck had problems. It had obviously spent a lot of time with a heavy smoker - it stank of stale smoke, and that or age had made it electrically and mechanically touchy. It was just usable if I was willing to watch over it while it was playing, and then tinker with it when the mechanism would unexpectedly stop for no reason. When the most recent 13 tapes showed up, though, I decided to fix the deck before I used it for this batch. There were two major problems, and a couple of minor ones, plus one I created myself when I blew two transistors in the power supply while poking a screwdriver in the wrong place. One of the major problems had been irrelevant for the first batch of tapes, and still was; still I wanted to fix it. The right playback amplifier was dead and just sat there generating noise. Now the tapes I had were recorded on a monaural machine which recorded on the upper half of the 1/4 inch tape (tracks 1 and 2 in the diagram below); the Akai is a stereo deck and the tracks are interleaved so that in the forward direction, the left channel is recorded on the upper 1/16 inch of the tape, track 1, and the right channel on track 3. That means that if the original monaural tape was recorded only in the forward direction, the left pickup of the Akai sees audio and the right pickup sees nothing, but if the original was recorded in both directions, the right pickup should reproduce the reverse track, reversed in time. The playback amplifier has two stages. The first is the input stage connected directly to the playback head. This stage worked fine. The second stage gets its input from a gain control that is connected either to the output of the first stage or to the tape deck record input, depending on the position of the source/tape switch. This was where the problem was. I quickly found on the web that the primitive IC used for gain in this stage, the LD3141, was notoriously flaky, and was known to produce the symptoms I was seeing. This IC (see the picture below) probably hasn't been produced in decades, although it is available on the web as "new old stock." I didn't want to go this route, as I figured that if I bought a replacement IC there was no reason it wouldn't develop the same problem. This IC is used in other Akai tape decks, and someone with a 1730D-SS has posted a fix that involves substituting an op-amp and making some circuit changes. It looks messy. I have the schematics for my deck, and the playback amplifier schematic shows what the LD3141 looks like inside, minus component values. 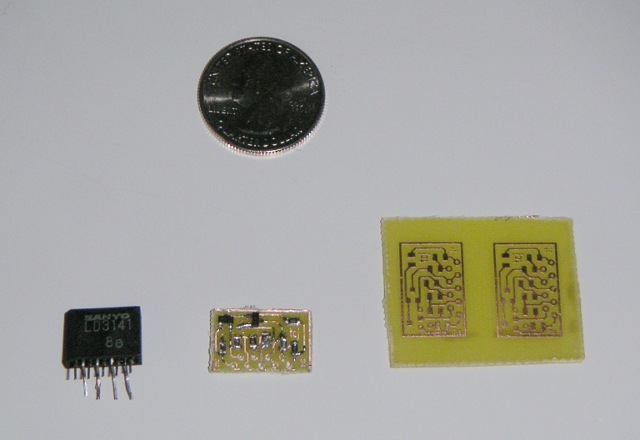 Six of the seven resistors come directly out to pins, and their values can be measured with an ohmmeter (on the good left-channel part I had), as they are isolated from each other by transistor junctions. The value of the seventh resistor, the one in the collector of the input transistor, can be deduced from the test voltages shown on the schematic. I figured it would be easy just to build a little board to replace the IC. 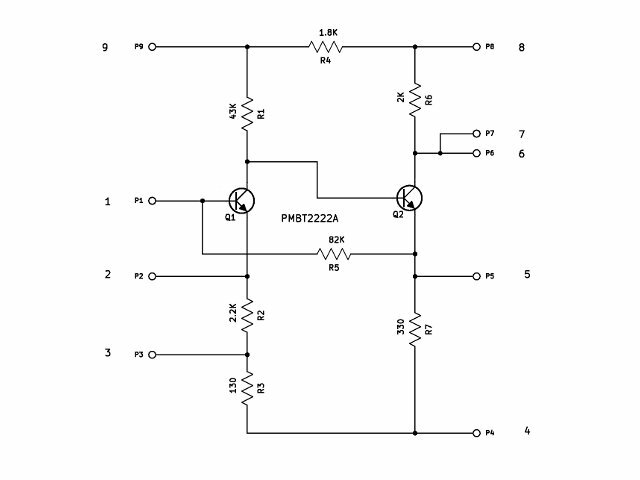 As for the transistors, there was no reason not to use the surface-mount equivalent of 2N2222A's, as noise performance isn't critical here in the second stage of a 1970's era tape amplifier. And 2N2222A noise perfomance isn't so bad, anyway. PDF of the board artwork - you should be able to duplicate this if you're willing to etch the board. When I first used the deck, the tape would stop during play for no reason and at random times, and it would often refuse to start up again on hitting the play button. This could happen every couple of minutes or every few hours. Playing with the tape tension arm (visible to the right of the capstan in the photo above) seemed to fix this sometimes. The tape transport control circuit is a complicated tangle of diode-transistor-relay logic. In a few places, it depends on the forward drop across germanium diodes being less than a silicon transistor base-emitter forward drop. Problems with a switch that would introduce an additional voltage drop would keep the transport from functioning properly. I took out the microswitch attached to the tension arm and found it intermittently changed on-resistance depending on how far in the plunger was pushed. It's an Omron part, V-1A44. It's not made anymore, but the Omron VX-5-1A2 from Mouser works as a substitute. I started out with another switch from Digikey, but discovered that the activation force was too great (100g instead of the roughly 25g needed here) and the tension arm wouldn't move smoothly. There are some other switches of this type used in the transport mechanism, so I may wind up replacing those eventually. 1. The capstan idler bearing squeeked. This comes off easily and I just put a little grease on the sleeve bearing. 2. The index counter wasn't moving at all. It turned out that it was completely frozen, and I had to take it out and work some oil into the sleeve bearing that its belt pulley is mounted on. Getting to it, of course, involved disassembling some of the transport. 3. I accidentally shorted the output of the power supply (which is on the servo board) and blew two power transistors, TR251 (a 2SC1013) and TR252 (a 2SD234). Neither of these transistors is available any more, but each can be replaced with a TIP31C. For the 2SC1013, though, the pinout is C-B-E, so you have to cross over the base and collector leads to make it fit on the board.